The GP2Y0D805 and GP2Y0D810 are Sharp’s smallest and fastest distance sensors, and our tiny carrier board for these sensors includes all of the external components required to make them work. With a sample rate of almost 400 Hz and a sensing distance to 5 cm (GP2Y0D805) or 10 cm (GP2Y0D810), this sensor provides an attractive alternative to shorter-range LED-phototransistor reflectance pairs and longer-range but slower sensors such as the Sharp GP2Y0A21YK0F analog distance sensor. The output, Vo, is driven low when the sensor detects an object; otherwise, the output is high. The GP2Y0D805Z0F detects objects between 0.5 cm and 5 cm away from the sensor face, and the GP2Y0D810Z0F detects objects between 2 cm and 10.25 cm away. 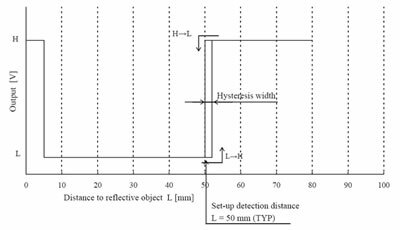 There are a few millimeters of hysteresis around the maximum range threshold and no hysteresis at the minimum range threshold. Note that these sensors will only tell you if there is an object within the detection range along their lines of sight; they will not tell you how far away the object is. Sharp GP2Y0D805Z0F digital distance sensor 5 cm measuring characteristics. Sharp GP2Y0D810Z0F digital distance sensor 10 cm measuring characteristics. The Pololu carrier board lets you interface with the GP2Y0D805 or GP2Y0D810 sensor using a three-pin 0.1" connector, such as the included 3x1 straight male header strip and 3x1 right-angle male header strip. You can connect to these pins with a servo cable or with a custom-made cable using pre-crimped wires and a 3x1 crimp connector housing. The square pad is ground, the middle pad is VIN (2.7 – 6.2 V), and the remaining pad is the sensor output, OUT. Depending on your power source, you might notice an increase in performance by placing a large (>10 uF) capacitor between power and ground somewhere near the sensor. A red LED on the back of the PCB lights when the output is low, indicating that the sensor is detecting something. If so desired, you can disable this LED by cutting the trace between it and the OUT pin where it is marked on the silkscreen or by desoldering the LED. The GP2Y0D805 and GP2Y0D810 have an optional enable input that can be used to put the sensor into low-power mode. The Pololu carrier board connects this input to Vcc so that the sensor is always enabled, but you can solder a wire to the pad labeled “enable” on the back of the PCB if you want control over this input. Note that you will need to cut the trace that connects the enable line to Vcc on the PCB if you want to be able to disable the sensor. This trace is marked on the silkscreen, and there is a caret that indicates where we suggest you make the cut. The carrier board has a 0.086" mounting hole for a #2 screw. You can make the module more compact by cutting or grinding off this portion of the PCB if you do not need the mounting hole. Note: This product comes with the GP2Y0D805Z0F soldered into the carrier PCB.